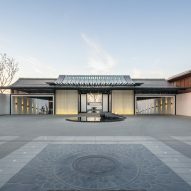 Lacime Architects based the layout of Shimao Longyin Leisure Centre, in China, around a series of classical Chinese gardens to create serene outdoor circulation areas. 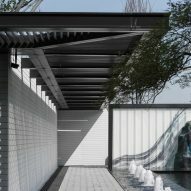 The Shanghai-based studio designed the leisure centre as a contemporary interpretation of Suzhou's traditional architecture. 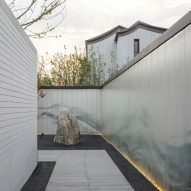 Landscaping firm Landao International Design helped to introduce elements representing the region's rich heritage of classical Chinese garden design. 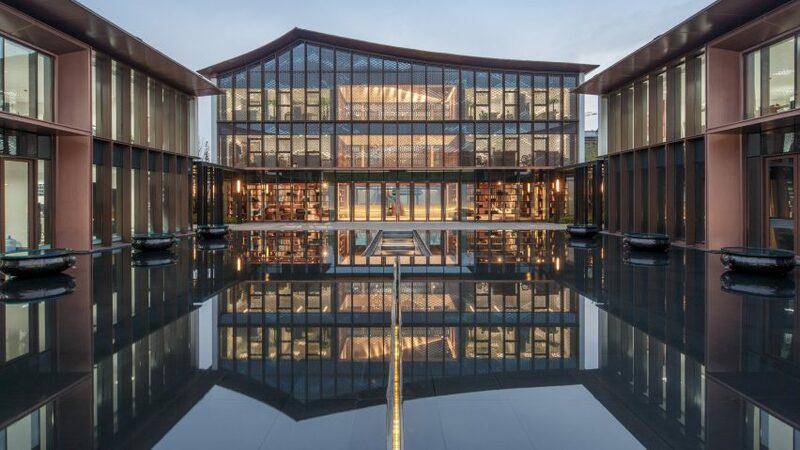 "The leisure centre combines inner space and landscape together using an asymmetrical spatial mode, creating a traditional spatial pattern that evokes the Suzhou Garden style," said Lacime Architects. The Classical Gardens of Suzhou were built during a period from the 11th-19th centuries, and are now included on the UNESCO World Heritage List. 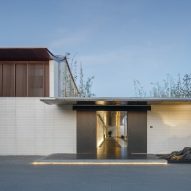 They were mostly built by scholars and feature constructed landscapes designed to mimic idyllic natural scenes dotted with pagodas and pavilions. 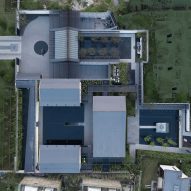 Much of the site for the leisure centre is dedicated to landscaping and the creation of a carefully designed walking route that offers varying perspectives of the building as guests move around. 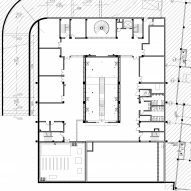 Three main courtyards arranged along the route generate what the architects described as a "symmetry and orderliness" that defines the character of the site. Large entrance gates open onto a paved outdoor space with a circular pond at its centre. 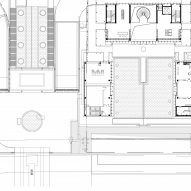 Beyond this is an elongated courtyard containing a series of reflecting pools containing trees and a gravel garden. A pair of ramps sweep down from the entrance courtyard to connect with facilities accommodated on a basement level. 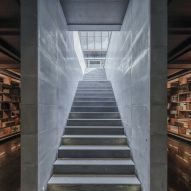 These spaces can also be reached using stairs that descend beneath the surface of another large reflecting pool enclosed by the building's upper floors. 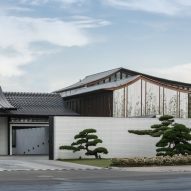 The leisure centre's architecture references traditional Suzhou houses, which typically feature blank gable ends topped with asymmetric curved roofs. 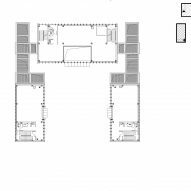 Its halls feature similarly sweeping roofs of varying heights and proportions. 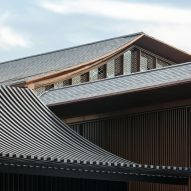 These roofs are covered with tiles, with the exception of a slatted metal canopy that tops the entrance pavilion. 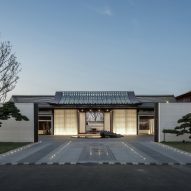 While the majority of the facades are simply clad in white stone or metal panels, the elevations surrounding a central pool are fully glazed to ensure the internal spaces receive adequate daylight. The glass curtain walls are arranged behind a ribbed surface that recreates the appearance of a traditional colonnaded courtyard. The main hall's gable ends are also covered with a delicate patterned lattice that varies in density across its surface. Shimao Longyin Leisure Centre is located within the Suzhou Industrial Park – a modern industrial township developed in collaboration between China and Singapore to promote international cooperation and new ways of living. 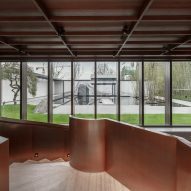 David Chipperfield used classical landscaped gardens between the red volumes of the Zhejiang Museum of Natural History, whist OPEN Architecture sunk an entire art gallery into some dunes in Qinhuangdao. Photography is by Schran Images.